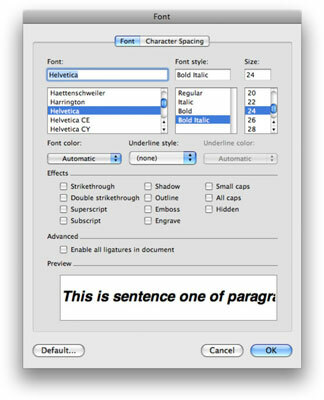 In Word 2008 for Mac, you can change the font, font size, and style of text, color or text, and even apply special effects to text, such as a shadow. Before you change fonts, you usually have to select text or images you want to modify. Click a font of your choice from the Font list. In the Font Style list, choose bold, italic, or any of the other attributes you want. To make the text bigger or smaller, scroll down in the Size list and click a size. Choose your Font color and Underline style and color. Strikethrough: Places a single line through the middle of your text. Double Strikethrough: Places two lines through the middle of your text. Superscript: Superscripts the character(s) you select. Subscript: Subscripts your selected character(s). Shadow: Creates a shadow effect. Outline: Makes your text look as though it’s outlined. Emboss: Makes the text seem to pop out. Engrave: Makes the text seem engraved on the page. Small Caps: Small caps look like this: Small Caps. All Caps: Capitalizes all your selected text. When you’re finished making your changes, click OK. The Preview area near the bottom of the Font dialog shows you the effect of your choices before you click the OK button.